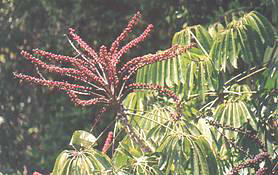 This is a member of the family Araliaceae, which are widely cultivated in tropical and sub-tropical gardens. It has bright red flowers, borne on groups of long spikes that radiate out from the end of each branch and provide a rich nectar source for honeyeaters and lorikeets, such as the Rainbow Lorikeet. Umbrella Trees sometimes grow as epiphytes high up in the canopy. The 'Umbrella tree' or 'Octopus Plant' usually grows as a climber on other trees in the rainforest, monsoon forest and sometimes woodlands of tropical Australia and New Guinea, it's roots resembling a strangler fig. Once established it may grow as a large tree in it's own right. It is called the 'umbrella' tree due to the circular arrangement of it's leaflets. The flowers are held in umbels along the long 'octopus' arms that are held at the end of the main stalk, high above the other branches and leaves. Later, small umbels of hard red fruits develop along the same arms. Specimens can easily be seen along the Cape Tribulation road.